Acmadenia obtusata (Thunb.) Bartl. & H.L.Wendl. Acamadenia obtusata forms a variable shrub, displaying floriferous pink flowers with aromatic foliage. Characteristic of the citrus family are oil glands found on the leaves, which release a fragrance unique to each species. Acmadenia obtusata is a single-stemmed, rounded or upright shrub, reaching a height of 0.3 to 1 m.depending on locality and conditions. Leaves are evergreen, linear (needle-like), 10 to 11 x 1.3 to 1.7 mm, opposite. Oil glands are seen on the underside of the leaf, on either side of the midrib. Star-shaped, pink, solitary flowers are borne at the ends of short branchlets near the stem apices. Flowers are bright pink, 5-petalled, spreading, and 10 mm in diameter. Singular or groups of 3-5 flowers brighten up the bush during April to November, creating a buzz of activity by bees, insects and butterflies. The fruit is light green in colour and darkens as the capsule matures to release its seed. It forms a 5-chambered capsule bearing one black, shiny seed per chamber. 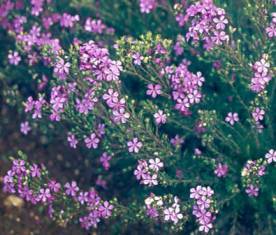 It occurs naturally in mountain fynbos, found growing on dune and limestone hills of Bredasdorp, Gourtiz River and near Port Elizabeth. Acmadenia is derived from the Greek akme, meaning highest point and aden, meaning glands on the anthers. The specific name obtusata means blunted in Latin, but it is not clear what this refers to. 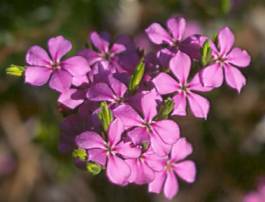 In the genus Acmadenia there are 33 species of small, evergreen shrubs growing to a height of 0.3 to 1 m, flowers usually pink or white. Other interesting species: Acmadenia heterophylla, forms a dense, low-growing shrub with bright pink flowers in autumn. Best used as a border plant and suitable for rockeries. Acmadenia mundiana is another species to cultivate. It is a palatable (tasty) shrub and often grazed. Acamdenia obtusata can be used as a filler plant in a mixed fynbos bed; as a border or hedge plant by planting it in masses; or as a container plant. Cut, flowering stems can be used in mixed floral display. Acmadenia obtusata as well as most of the species found in the Rutaceae family are best grown in full sun, in soil that is alkaline to acid (depending on the species), well-drained and composted. This plant comes from limestone areas and may be easier to cultivate in gardens than many other acid loving fynbos species. Buchus are best planted out during autumn, winter and spring. Plant out in-groups of three to five with enough space to grow. Add a layer of mulch to keep the soil moist and reduce weeds. Buchus are slow growers and should be planted not too close to faster growing shrubs. Plants require good watering in winter and moderate watering in summer. Once established, buchu will survive periods of drought and tolerate wind and a fair amount of frost. Buchus can be grown from seed or cuttings. Fresh buchu seed is sown in autumn. The seed are sown into a tray containing a well-drained medium of equal portions of sand, loam and compost. Use some of the medium to cover the seed and water. Place in a covered area with good light and air circulation. Keep medium damp. Germination occurs in one to two months. Young seedlings are pricked out into 0.5 litre bags when four true leaves have developed, using a fynbos medium. Pinch out the growing tips of the seedlings to encourage bushy growth. Flowers are produced after two years. Cuttings have the advantage of producing a larger flowering plant quicker than seedlings. Tip cuttings, 50-70 mm, are taken from the current year's growth. Prepare cuttings by making a clean cut below the node and remove a third of the foliage. Dip the base of the cutting in a rooting hormone. Firmly place the cuttings in a medium of 50% bark and 50 % polystyrene. Ideally these cuttings should now be placed in an well-aerated propagation unit with a bottom heat of 24º C. Rooting occurs in 9 to 11 weeks. Carefully pot the rooted cuttings using a well-drained, humus-rich, fynbos potting medium (2 parts leaf mould, 1 part coarse sand). Plants will be ready for planting in 7 to 8 months. Feed regularly with a well-balanced nutrient. Yellow leaves can be treated with an application of iron chelate. Gold, M. 1992. The buchus: cultivation and propagation. National Botanical Institute, Kirstenbosch, Cape Town. Mustart, P., Cowling, R. & Albertyn, J. 1997. Southern Overberg. South African Wild Flower Guide 8. Botanical Society of South Africa, Cape Town.